Remember this post? The weird blind date where I played a joke on that guy? 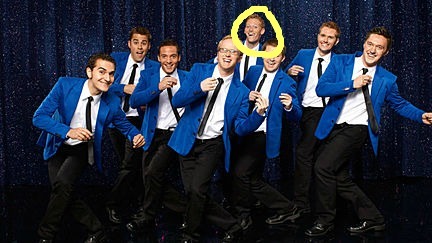 Well I don't know if you've been watching the Sing-Off, but if you are, he's in the group from BYU Vocal Point. My old boss told me he was on there so I started watching. They just got voted off this week but they did pretty good. Anyways, the guys i circled the guy who it was. So know you can put a face with the story. oh good times. haha i forgot about that story. well played, mickelle. glad i can put a face to the story.